Not every thing that sounds dirty… is. 2. Feel along the back, and beginning with the neck opening, cut along each side of the backbone – from tip to tail. 4. 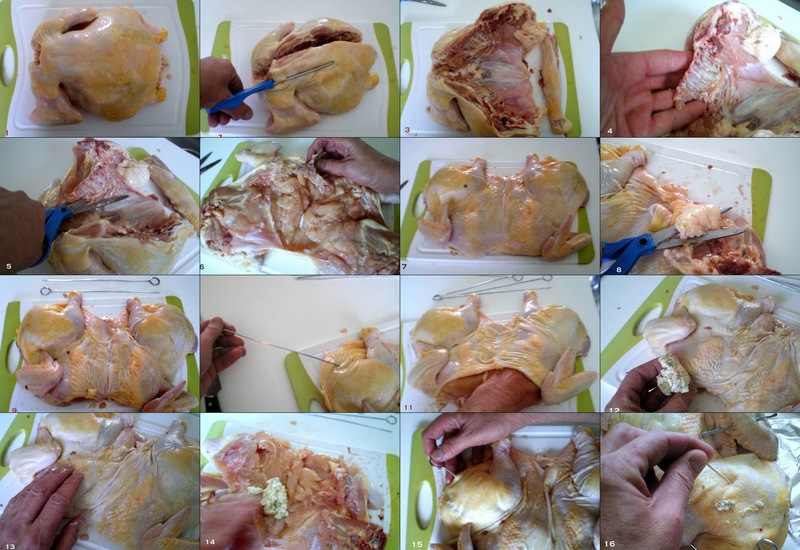 Open the bird flat – cut side up, and feel along the cut for the ribcage. Slide your fingers under the bones and lift away from the bird. 5. With the shears, cut along the base of the ribs where they connect to the breast plate – Repeat for both sides. 6. With your fingers, slide along the cartilage and locate the triangular breast bone. 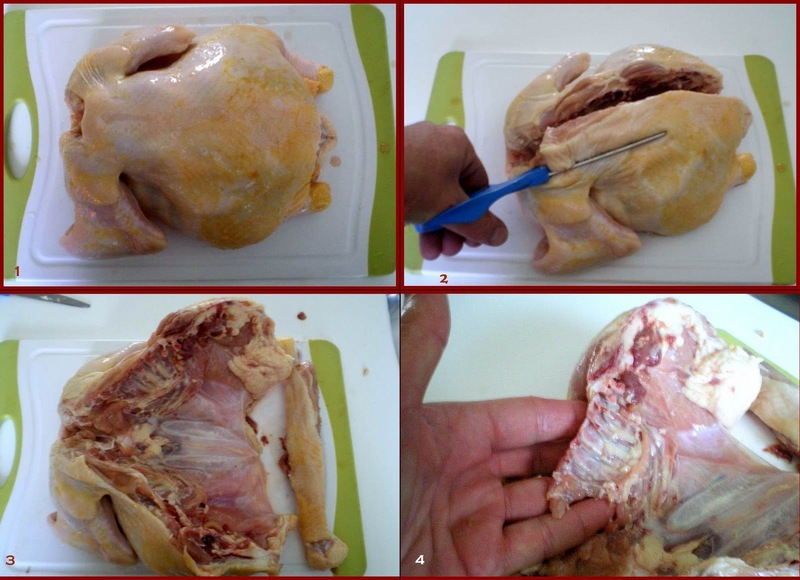 With the boning knife, slide the blade along the bone and free it from the muscle. Lift and remove the bone. 7. 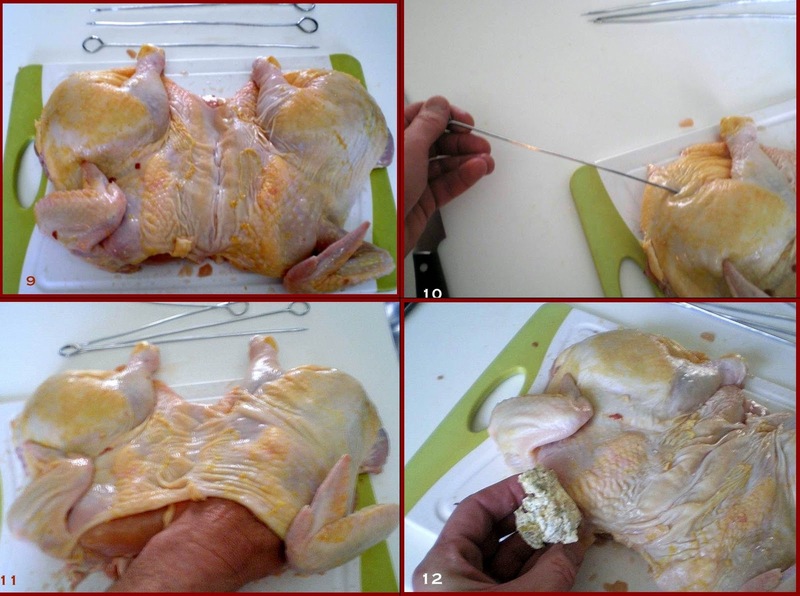 Flip the bird over and flatten the bird against the cutting board. 8. 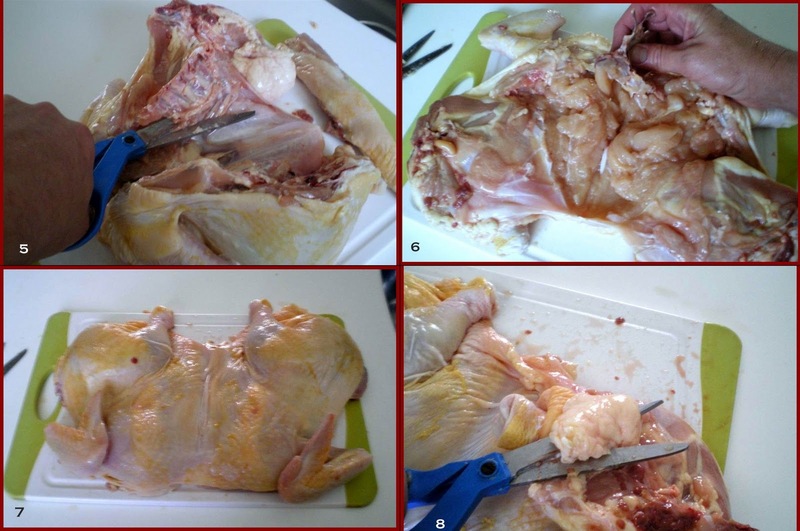 With the shears, remove the upper cavity fat globule as well as the excess skin flaps at the tail. 11. Beginning with the breasts (heh..he..he..heh), Slide your hand between the skin and the muscle. There will be a small membrane just inside the breast area – but your fingers should push through it easily without much pressure. Continue pushing under the skin, loosening all the way to the thigh and around the leg. 12. Divide the compound butter into 3 equal portions. Place 1/3 of the butter under the left breast skin. breast. 14. Flip the carcass over and liberally smear the remaining 1/3 of the butter on the underside. Flip the bird one last time to skin up..
16. Liberally salt the exposed skin of the carcass, and with a toothpick, poke several places on the skin where you see thicker areas of fat located. Roast the Hen for 45 minutes, or until the interior temperature reaches 170 degrees. Remove from the oven, cover with foil and let rest for 15 minutes before carving. Mix all ingredients in a bowl and set aside for use. On high heat, bring the sauce pan with water to a boil. Hehehe, first time I heard this term. Thanks for the instruction how to do that. I am sure when I use that term with my family, I will get lots of eyes rolling! LOL! Hehehehehee giggles aside, that bird looks DELICIOUS!!! You need to come to Australia and cook for me, hehe. Is it wrong that before I also pointed to the title of this for my BF to see what I was giggling at and then continued to giggle at your next few lines? Thanks for the tutorial though! I love the amount of pictures, its super helpful. So glad I am not the only one who still giggles at the term 'spatchcocking'….among others…tee hee! Everything looks great though! I will have to try this (without the giggles)!